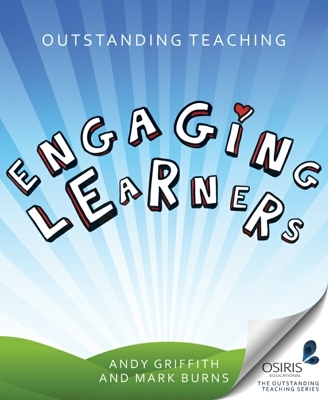 Outstanding Teaching: Engaging Learners has been short listed for the 2013 Education Resources Awards in the Educational Book Award category. At the end of every week many teachers leave school exhausted. In an era when responsibility for exam results lies with them and not their students it s time to redress the balance so that students take more of the responsibility for their learning. Written in the same humorous, thought-provoking style with which they both teach and train, Andy and Mark aim to challenge all who teach, from NQTs to seasoned professionals, to reflect on their day-to-day practise and set an agenda for sustainable improvement. Books in education tend to be dry academic tomes or full of anecdotes usually premised on “do what I did”. Outstanding Teaching is neither – it is based on a rich analysis of thousands of videos of successful teachers, is imbued with a sense of fun, but has some very serious messages. What a treat – Outstanding Teaching an engaging book emphasising the core qualities of teaching while making it sound fun. Each chapter offers an appropriate balance of research and practical tips meaning not only are you working with ideas that generate outstanding learning in the classroom, but will also understand why they work – meaning you can go on and develop more ideas yourself. The magic of this book is the motivational way in which it is written. Teachers cannot fail to be engaged by its down to earth style. The instant classroom tips which professionals can gain are evident on each and every page. A great and practical read! The authors have distilled their years of experience in and around classrooms into an easily-accessible and usable text. When motivation meets empowerment, shift happens. This book will generate shift. There are many outstanding teachers … and some of them are recognised. Most teachers would seek to be the best they can in order to help the pupils that they teach become the learners we would want them to be. This book will help teachers to bring together the art, the science and the craft of teaching. Andy and Mark have managed to distil the work they do alongside teachers on their course programmes into print in a way that is readable and practical: no mean achievement! It is a book full of suggestions, ideas and techniques which are grounded in a coherent outlook on what makes outstanding teaching. It will help with inspection … and it is much more. Reading this book will shed light on the work we do in classrooms and the way we engage with youngsters and will also make us think about the very purpose of teaching. Outstanding Teaching reflects Andy and Mark`s views that all teachers can be enabled to improve with the right support and guidance that is tied to clear criteria that allows them to see how to move forward. The strength of the book comes from the number of strategies that are included, alongside real-life examples that can support classroom teachers in engaging students. To learn, students have to be engaged this book gives a route map of what engagement is, what it looks like and the strategies needed to achieve it. Teachers need to do this before anything else, such as learning and progress, can happen in classrooms this is what makes this book a valuable tool to classroom teachers. Cutting through the complexities of the classroom with a well-evidenced and researched set of level performance descriptors (ones which Ofsted would do well to look at), Andy Griffith and Mark Burns provide themselves with a platform on which the rest of the book is based. Each chapter offers an appropriate balance of research and practical tips, meaning that not only are you working with ideas that generate outstanding learning in the classroom, but that you will also understand why they work – so you can go on and develop more ideas yourself. The encouragement given to reflect on your own performance as a teacher is well supported with numerous techniques and strategies, with the reader getting a sense that the authors have benefited themselves from reflection in their own classroom and therefore are justifiably passionate about how this helps achieve excellence. And it is that commitment to excellence that perhaps is the overriding tone of the book. So, whilst the authors point out that there are no money-back guarantees, if outstanding learning is not the outcome as a result of reading this book I doubt very much that anyone will need a refund. Quite the opposite. They will be recommending it to a colleague. Just like I have.